One of very our first African Portfolio clients was a young woman who booked a six week safari traveling throughout southern Africa, solo. On her return, I fully expected her to cite the amazing lion kill she witnessed in the Sabi Sands or the leopard and cub she spotted at dusk in the Lower Zambezi as absolute highlights of her safari, but instead she waxed poetic about the surreal landscapes of Namibia. We have heard the same rave reviews many times since, and after my last visit, I still concur: It truly is a land of contrasts and diversity, offering some of the most unique landscapes and remote wilderness, that I have ever seen. My first stop was Walvis Bay and Swakopmund, situated on the west coast of Namibia, where the German influence is still very apparent and the seafood is as good as it gets. Swakopmund has become known as an ‘adrenalin’ destination with numerous adventure activities on offer. 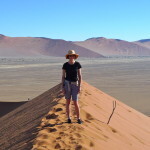 I didn’t participate on my short stay, deciding to rather conserve my energy for climbing the dunes of Sossuvlei. There are miles of spectacularly beautiful coastline and not very many people, which begs the question why this region hasn’t been more developed as a seaside resort destination. Expecting hot summer temperatures in Namibia in October, I soon realized that early mornings and evenings in Swakopmund and Walvis Bay can be cold (even freezing) throughout the year, as the cold Atlantic Ocean meeting the Namib Desert, creates a dense layer of fog. This coolness is often a relief from the heat of the rest of Namibia, but does mean that Swakopmund is not the tropical sunbathing paradise that one might imagine. 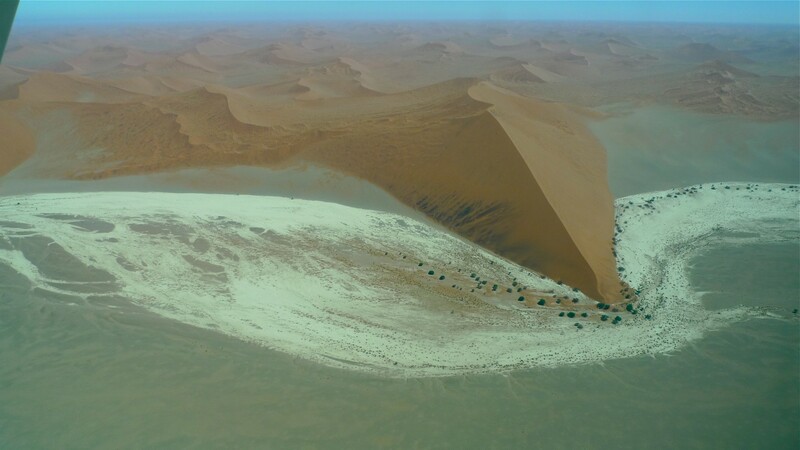 Next morning we climbed aboard our Cessna 206 for an incredibly scenic (very low flying) charter flight to the famous dunes of Sossuvlei. 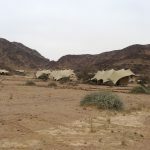 The lodge, Little Kulala, was everything I expected it would be – an oasis of simple luxury in the middle of the desert. Needless to say, the best part about the rooms was the roof top, sleep out deck. There is nothing like sleeping under a b lanket of southern African night stars – exquisite. Within the first 30 minutes of our late afternoon game drive, I was surprised and excited to have seen at least ten new bird species including Ludwig’s Bustard, White-backed Mousebird, Chat Flycatcher, Ruppell’s Korhaan, Southern Pale Chanting Goshawk, Sociable Weaver, Dune Lark and the Bokmakierie. For me, even more impressive than the height and formation of the dunes was their coloring. Mountains of red sand whose sharp edges contrasted against the bluest sky made the landscapes we were viewing seem like oil paintings. The most surprising aspect of the climb up Big Daddy, some 300 meters tall, was how much it felt as though you were teetering along a narrow precipice. Okay, I am not the most fearless when it comes to heights, but I never expected climbing a sand dune to feel like scaling a mountain. However, ‘falling down’ the dune was as much fun as all the photos I had seen of people leaping through the air. Walking through the Dead Vlei we learned about the White Lady Dancing Spider, one of the many uniquely adapted species found in the desert. 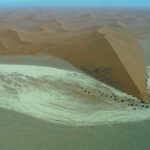 They burrow large holes, which are covered by interwoven strands of silk and sand, which make them very difficult to find. During the heat of the day the spiders rest deep below ground, and then during the night, they position themselves upside down in their tunnels, “listening” for vibrations using the sensitive hairs on their legs. At the opportune moment, the spider rushes to the surface and ambushes the prey. The day concluded with a walk through the 3 kms Sesriem Canyon, yet another geological wonder, formed by water carving its way into the earth, over the course of millions of years. 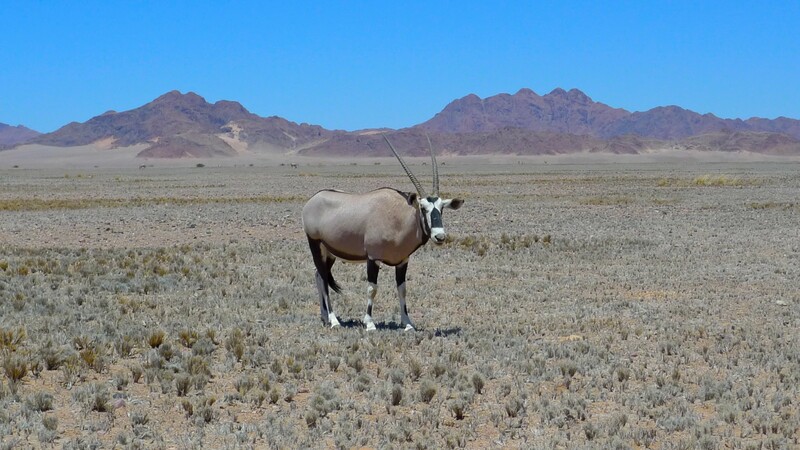 It soon became apparent to me that the single most remarkable aspect of Namibia is its incredible geological history. It is almost impossible to comprehend the ecological transformation that has occurred over millions of years and its impact on the biosphere. 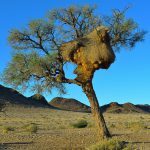 During my short stay, I barely had time to scratch the surface in understanding how the forces of nature have colluded to create the landscape of Namibia. 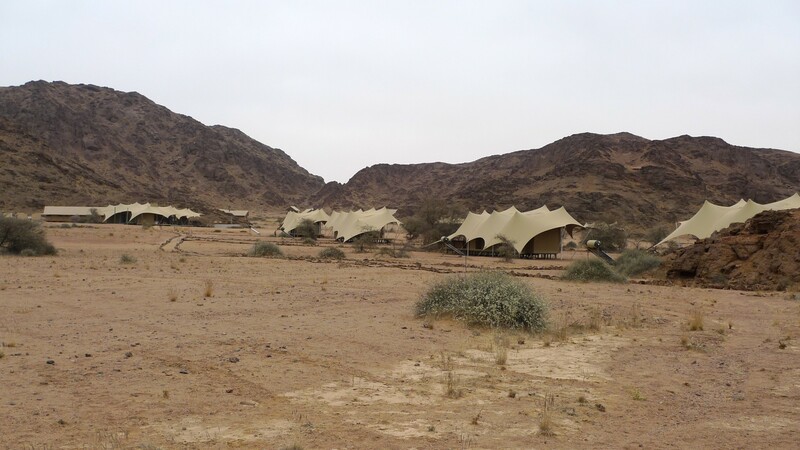 This was no more evident than during my four days at Hoanib Skeleton Coast Camp, situated in the northern Palmwag area, adjacent to the iconic Skeleton Coast National Park, in one of the most remote regions of the Kaokoveld. The area is surrounded by Gneiss rock formations, a high grade metamorphic granite, that has been created by high temperatures, pressure, upliftment and erosion over millions of years. The condensation of salt from the fog that rolls in from the coast continues to break down the rockface, making soft spots which the wind can then penetrate and erode. It may not sound exciting, but the result is a natural gallery of amazing and artistic stone sculptures. The highlight of my visit to Hoanib was a full day excursion to the coast. When Gert, my guide announced that it would be a three+ hour drive to the coast, I (inwardly) groaned. However, it turned out to be one of the most interesting wilderness/game drives I have ever undertaken. We primarily drove through the dry Hoanib River bed. The last proper flood was in 1992 but during the months of March and April, some water does flow, providing much needed water for the flora and fauna. The surrounding sand we were driving through looked like a beautifully textured carpet, created simply when the wind blows, as the heavier sand stays behind and the lighter weight sand blows away, resulting in perfectly symmetrical waves and patterns. Birdlife was surprisingly prolific given the harsh desert conditions. We saw white backed vultures, lappet faced vultures, spotted rock doves, pied crows, Benguela long billed lark, mountain wheatears and Namaqua sand grouse. Little did I know my dune climbing days were not over – fortunately – because we experienced the amazing phenomenon of the roaring dunes. As you roll down the dune, it sounds like a jumbo jet is passing just overhead as the swishing sand echoes and reverberates around the dunes – very cool. As we approached the coast, we stopped at the mouth of the Hoanib River, where a lagoon has been formed by geological and climate change, which is now home to flocks of flamingoes. 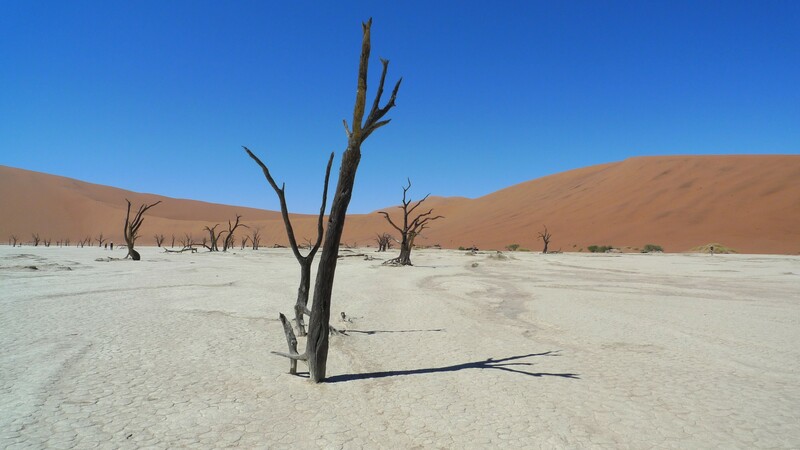 And then there we were … we had reached the dramatic Skeleton Coast. My guide then suggested I climb into one of the seats on top of the vehicle, which was the most perfect perch, as we drove down the beach taking in the most spectacular scenery. Along the way, we came across the Cape Fur Seal colony, home to 80,000 to 100,000 seals, in a relatively small coastal inlet. And yes, I was able to see several of the numerous shipwrecks that occurred along this coastline from 1923 to 1978, before more sophisticated navigational equipment was available to prevent these tragic accidents. After a delightful seaside picnic lunch, we returned to camp by air, providing a spectacular aerial view of the coast and the lunar-like landscapes we had just driven through. Not expecting much in the way of wildlife, to my delight, we spent the following day on a full day game viewing/wilderness excursion. No sooner had we driven out from camp, then Gert instructed us to keep quiet, make no sudden movements and keep hands and legs in the vehicle as we approached a group of 5 young male lions – affectionately called the Five Muskateers. 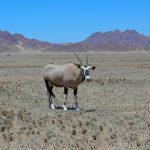 In my opinion one of the most beautiful of the antelope species is the Oryx (Gemsbok), and I saw lots of them, as they are also one of the best desert adapted animals. I was also lucky enough to see a group of 8 giraffe drinking at one of (only 2) waterholes in the vast Skeleton Coast National Park. Most surprising was to come across a herd of 16 elephant who were enjoying a rare bit of lush green bush (created by a natural spring). In the group were four baby elephant, which are equally rare due the diminishing number of breeding female elephant. On our drive, we met up with Laura Brown and Rob Ramey, two Boulder, Colorado based Ph. D. researchers who have been studying these desert adapted elephant since 2006. Fortunately, they were coming to camp that evening to give a talk on their work and I then had the pleasure of continuing the conversation over dinner. Did you know that desert adapted elephant can go for 3-7 days without drinking? 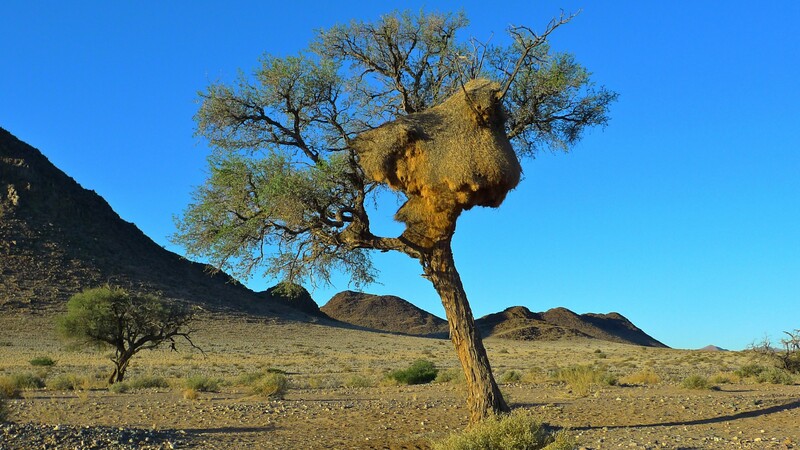 Did you know that desert elephants will migrate long distances (100 kms) to feed on the seedpods of the Ana trees (Faidherbia albida) when they are ripe? I encourage you to learn more about the fascinating and important work they are doing by visiting www.desertlionandelephant.org. For me the great game viewing was a bonus because I was so enthralled with the flora, insects and of course the scenery. 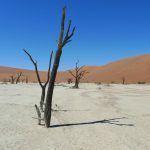 At last I was introduced to the legendary Namibia Welwitschia, one of the oldest and most unique plants in the world, which only germinates when it is 80 – 100 years old. Just think about that! 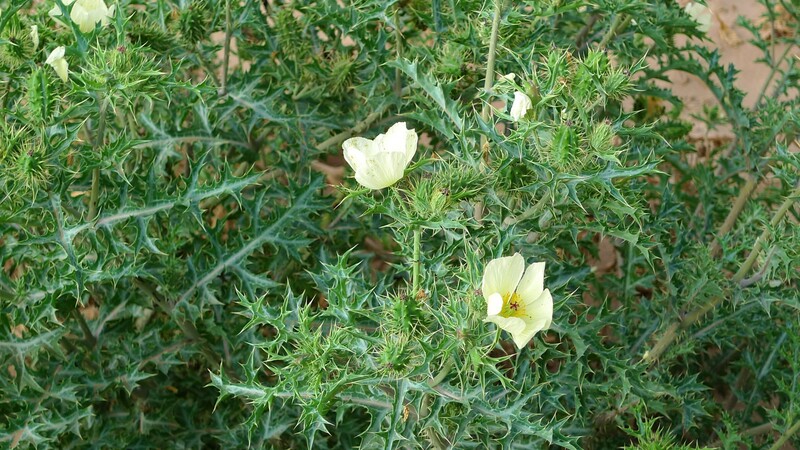 I also learned about the incredibly versatile Namib Star Bush, named for the star shaped flower it produces. 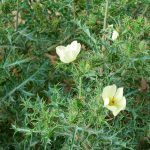 The flower closes during the day and the leaves cover themselves with a wax like substance to minimize the sun’s radiation but the flower opens again at night to absorb the moisture from the fog and low lying clouds. The size and arrangement of the leaves then also acts to block and reduce the speed of the wind, which prevents erosion. Grass seeds and other leaves and plant debris that are blown around the desert floor get ‘stuck’ underneath this bush, which then becomes food for other animals. Yes, I could tell you so much more … but I’d rather not give it all away. So particularly for those seasoned Africa travelers or at least for those on their second time around, I can highly recommend a visit to this beautiful and intriguing place.